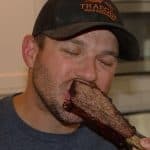 Know what’s really good with good barbecue? Good beer! Give me a half rack (or full rack) of baby backs and a good pilsner, and I’m a happy man. Serving up some brisket? IPA, please. Are we serving cake and eating it too? Let’s drink a stout. 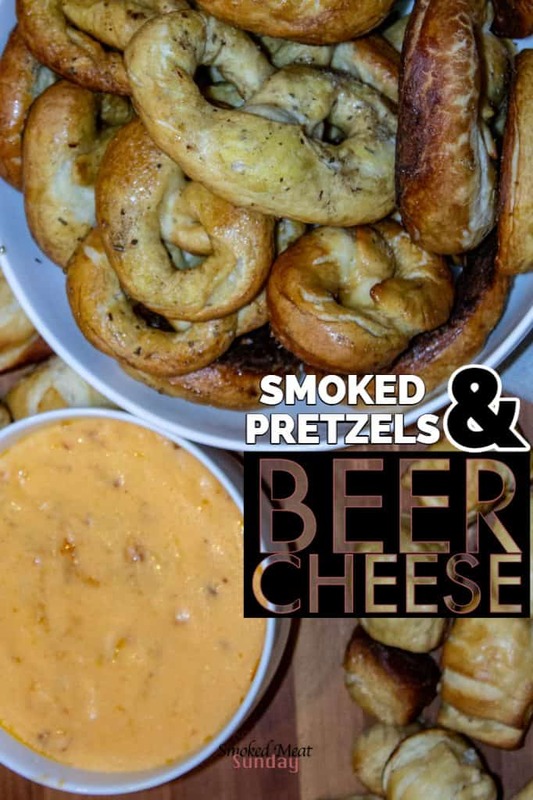 Or maybe we are just eating some good soft pretzels dipped in smoked beer cheese… Hook up the lager! Some people might turn their nose up at my recommendations, and that is ok! I believe you should drink whatever beer makes your palate happy. I’m not a beer connoisseur, but I know some people are. For those people, there’s Albertson’s on Broadway. Maybe you have a specific type of beer you love, or maybe you just enjoy trying different styles and brands of beers. Albertson’s on Broadway has a little bit of everything when it comes to beer. 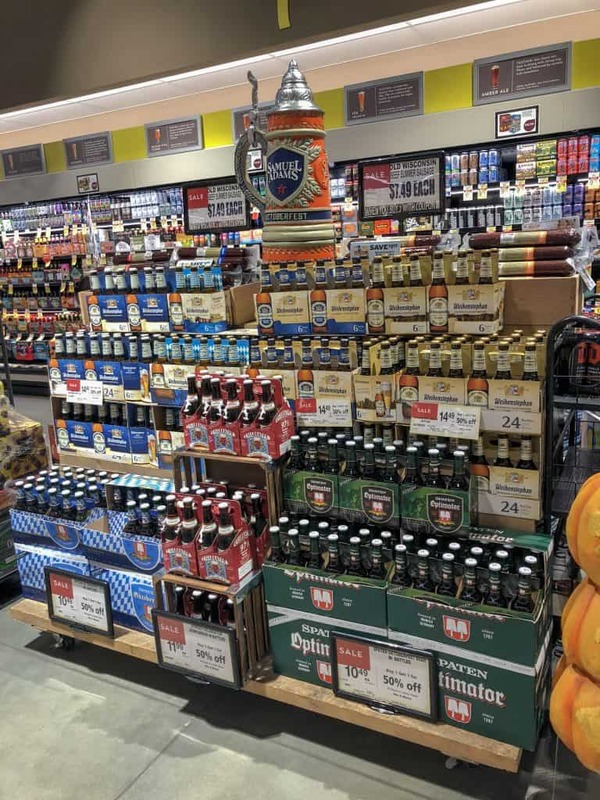 This week you can “Hop” into Fall with Oktoberfest at Albertson’s on Broadway. Now through October 2nd, they have all kinds of fun beer-themed events going on. 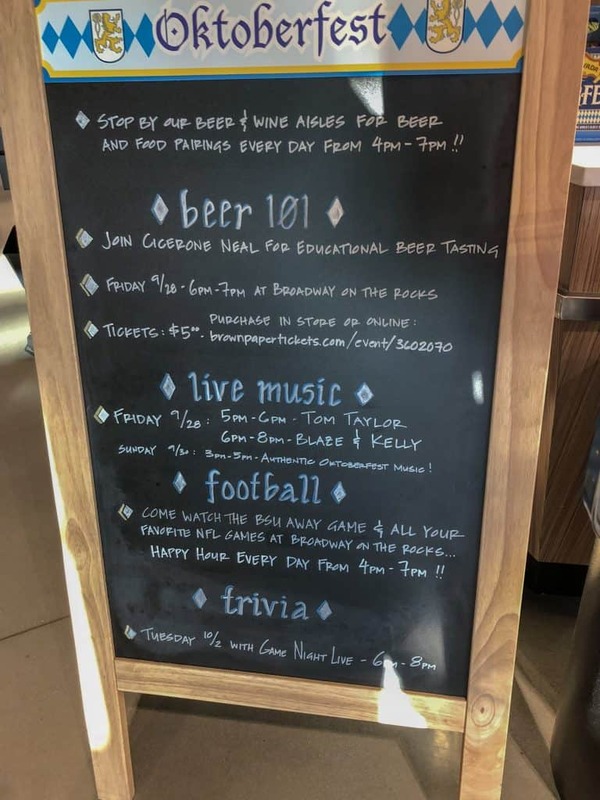 On Friday the 28th at 6 pm you can meet their local Cicerone and learn about the basics of beer, sample a few different styles, and learn how to pair beer with food. This is a ticketed event, so if you want to go, get your tickets here. Before you leave, head up to Broadway on the Rocks and enjoy a German Chocolate Martini or a pint of German Bier! 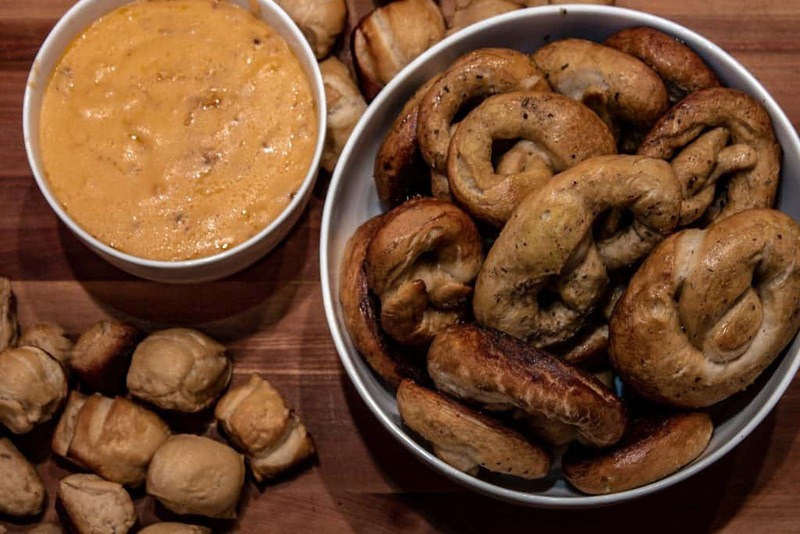 Have you ever made your own beer cheese? I made both, and the end result was a combination of smoky, cheesy, hoppy flavor that was to die for. Head over to Albertson’s and pick up a few of your favorite beers, a few different flavors of cheese, and some active yeast. You’ll need flour, salt, sugar, and baking soda too. These pretzels are really fun to make. Pour one 12 ounce beer in a saucepan and warm on low heat. Use your instant-read thermometer and when the temp hits 110 remove the beer from the heat. Add one packet of active yeast to the beer, along with a tablespoon of kosher salt. Put 3 cups of flour, 2 tablespoons of softened butter, and 2 tablespoons of sugar in a mixing bowl. Pour your beer mixture in, and then using the bread hook on your mixer and mix on low until a dough forms. It will be super sticky… put another 1/2 cup of flour in the mixing bowl, and mix again. Continue this process until the dough is no longer sticky. Throw a small handful of flour on your counter, and knead your dough into the flour for 4 to 5 minutes. Kneading the dough helps strengthen the fibers in the bread, and make it light and airy. When you’re done kneading the dough lightly grease your bowl. Put the dough in the bowl, turn it over one time, and cover with saran wrap. Place the bowl in a warm area and let the dough rise for about an hour. When the dough has doubled in size it’s time to start making your pretzels. Put the dough on a lightly floured surface and knock it down, and then separate the dough into 8 equally sized balls. You could roll each ball out into a rope of dough that is about 12″ long and then loop it back on its self to create a large pretzel. Divide each ball a second time, and then create the rope, and make smaller pretzels. 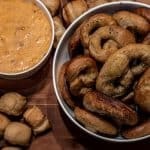 Roll each ball out into a rope of dough that is 15″ long, and then slice it into 15 pieces to create pretzel bites. I opted for options 2 and 3, and both were delicious. Before you start shaping the pretzel dough, pour 10 cups of water in a large stock pot, and combine with 2/3 cup of baking soda. Bring it to a boil over high heat. After all those pretzels and pretzel bites are formed, you’re going to put them in the boiling water for 30 seconds. Why Do you Boil Pretzels? Make sure the water is boiling hard. This step is what helps puff out the pretzels, and gives them that cracked golden brown appearance. Put a few pretzels in the water at a time, and then carefully remove them with a slotted spoon. Put them on a drying rack with paper towels, after they’ve been boiled. While the pretzels are drying get your smoker turned on and up to a temp of 400 degrees. In a large cast iron skillet combine 12 ounces of beer, 8 ounces of softened cream cheese, 8 ounces of cheddar cheese, and 8 ounces of mozzarella. Sprinkle 1 tsp of garlic powder and 1 tbsp of hot sauce (I used Frank’s Red Hot) on top of the cheese. Do your best to get the beer and cream cheese blended first, and then add the other cheeses. Grease two cookie sheets and then put your now dry pretzels on the cookie sheets. Try your best to keep a gap between each of the pretzels. 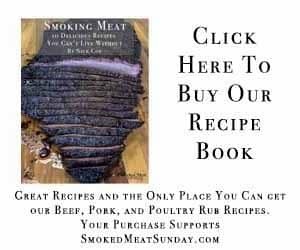 Put each cookie sheet in your smoker, along with the skillet of beer cheese, and let it all cook for 10 minutes. After ten minutes the beer cheese should be bubbly. Remove it from the smoker and let the pretzels cook for another few minutes. The pretzels are done when they look cracked and have that golden brown pretzel like appearance. Scrape the sides of the cast iron to get the cheese off the edges… those burnt pieces of cheese add some serious flavor! Mix it together and dip one of those pretzels in for a snack that everyone will love. Have you ever made your own pretzels? These beer pretzels have a hoppy flavor that your guests will LOVE! Pour beer in a saucepan and warm on low heat. Use your instant-read thermometer and when the temp hits 110 remove the beer from the heat. Add yeast to the beer, along with kosher salt. Put 3 cups of flour, softened butter, and sugar in a mixing bowl. Pour your beer mixture in, and then using the bread hook on your mixer, mix on low until a dough forms. It will be super sticky... put another 1/2 cup of flour in the mixing bowl, and mix again. 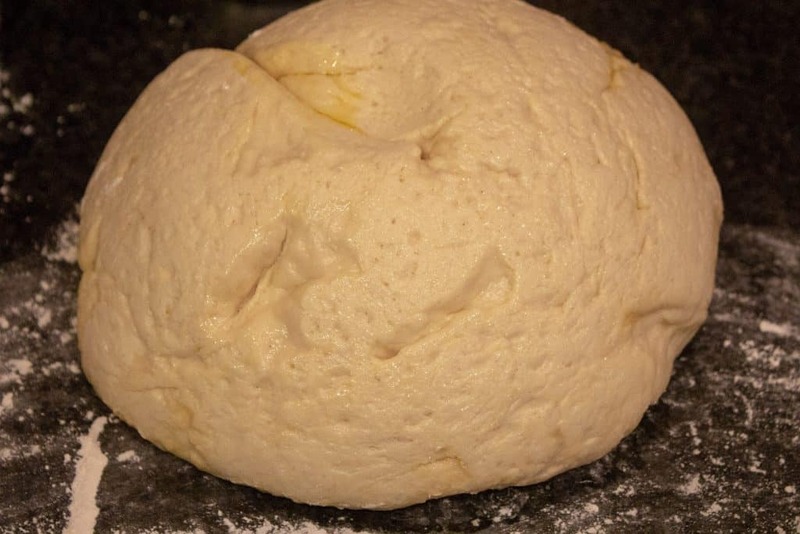 Continue this process until the dough is no longer sticky. Throw a small handful of flour on your counter, and knead your dough into the flour for 4 to 5 minutes. Kneading the dough helps strengthen the fibers in the bread, and make it light and airy. When you're done kneading the dough lightly grease your bowl. Put the dough in the bowl, turn it over one time, and cover with saran wrap. When the dough has doubled in size it's time to start making your pretzels. 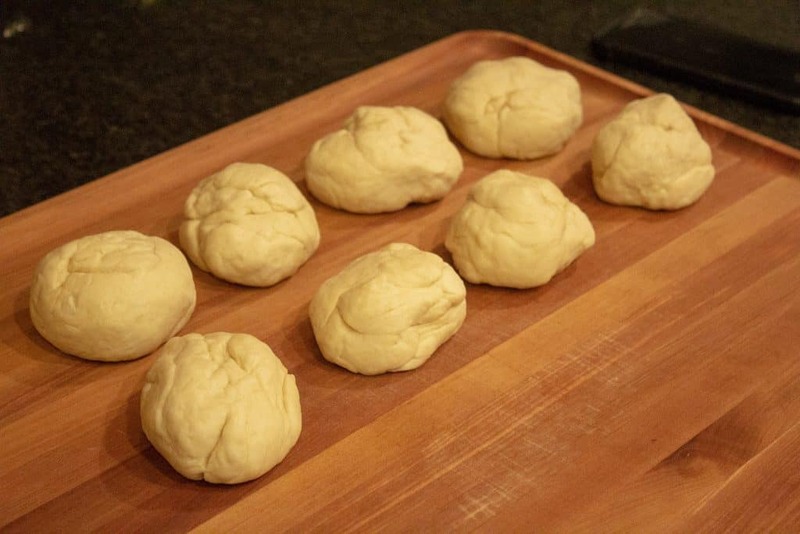 Put the dough on a lightly floured surface and knock it down, and then separate the dough into 8 equally sized balls. 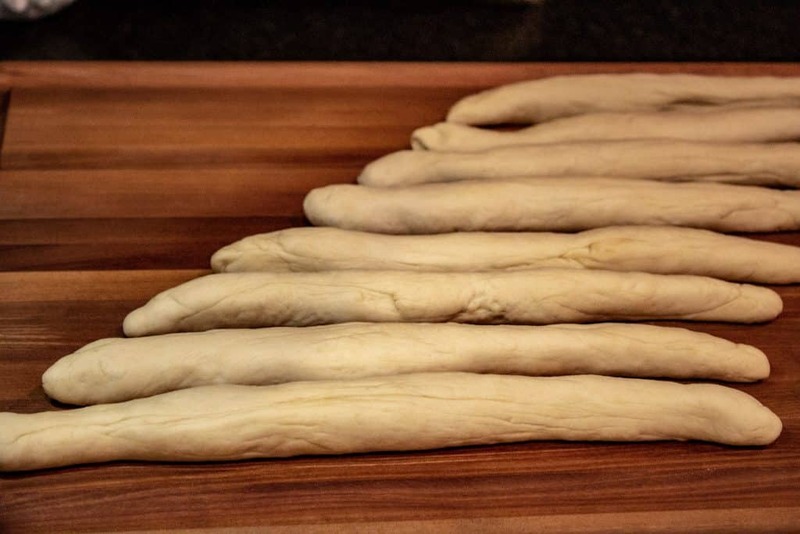 Roll each ball out into a rope of dough that is about 12" long and then loop it back on its self to create a large pretzel. 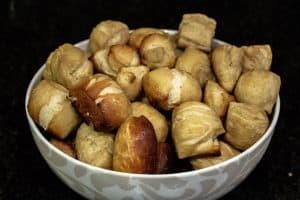 After all those pretzels and pretzel bites are formed, put them in the boiling water for 30 seconds. Make sure the water is boiling hard. This step is what helps puff out the pretzels, and gives them that cracked golden brown appearance. Put a few pretzels in the water at a time, and then carefully remove them with a slotted spoon. Put the boiled pretzel dough on a drying rack with paper towels. Grease two cookie sheets and put your now dry pretzels on the cookie sheets. Try your best to keep a gap between each of the pretzels. In a large cast iron skillet combine 12 ounces of beer, 8 ounces of softened cream cheese, 8 ounces of cheddar cheese, and 8 ounces of mozzarella. Sprinkle 1 tsp of garlic powder and 1 tbsp of hot sauce (I used Frank's Red Hot) on top of the cheese. After ten minutes the beer cheese should be bubbly. Remove it from the smoker and scrape the sides of your skillet to get all the cheese bits into the sauce. Mix and then serve.